Exactly how you need to structure your business for maximum growth and profitability, while at the same time minimizing the amount of hours you have to work. I’ll also walk you through the process of systematizing each piece of your business to make it all possible. The BLIND SPOT that most internet marketers have that prevents them from seeing one of the biggest growth sectors in a business. This is an area you cannot afford to be blind in! We are projecting over 50% of our income to come from this sector next year. 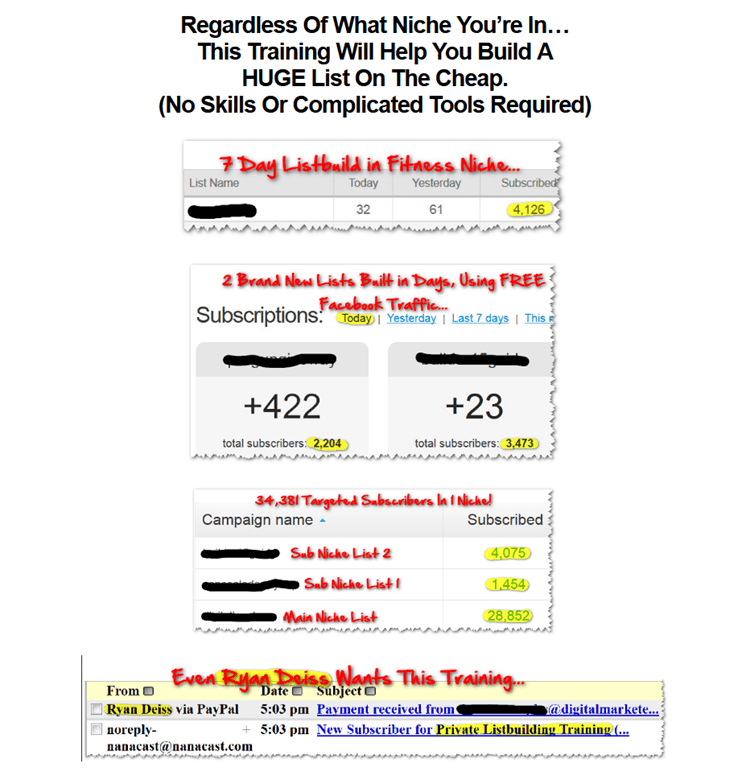 The new niche selection checklist and how to mine deep into a niche to find hidden ‘profit wells’ your competitors are missing. How to get paid (a lot) to give away free products your market will love…we’ve been doing this for less than 30 days and have added $21,000 in additional revenue already. How a casual comment by Los Silva lead to us finding an almost unlimited amount of traffic for practically any niche…most of which is going to waste every day. (Don’t let the good looks fool you…he’s a smart cookie). The simple tracking formula that can take a struggling business and turn it into a profit powerhouse in as little as 1 month. I’ll also show you the exact tracking system I use and how to plug it into your business FAST. Creating mid to high ticket ‘niche’ products is hard…at least we thought so until we learned a simple method from Mike Filsaime to easily create and sell products at practically any price point in our niche…stupidly simple and can be automated. A simple “add on” that takes 15 minutes to set up but will instantly QUADRUPLE your conversion rates with any offer you run. The new lead generation trifecta. I will show you the 3 way passive lead generating system we’ve developed that add between 100 and 150 new subscribers to our lists every day…on auto-pilot. The easy way to instantly build trust and credibility with your audience so they feel comfortable buying from you. Why everyone over-complicates continuity programs and what we will be doing differently after being taken behind the scenes of a “weaksauce” 18,000 person monthly membership full of happy customers. How to START SMALL and GROW FAST with this training. If this seems overwhelming…relax. I will show you how to start implementing these strategies and systems into your business, no matter how big or how small your company is right now…we build a business the same way we eat an elephant…one bite at a time! My ‘plain language’ overview that will explain all the goofy and complicated sounding terms Facebook uses in it’s ad system. Step-by-Step instructions on how to create, structure and launch every type of Facebook ad you’ll need to grow your business. How to use a 3rd party website to increase the ROI of your Facebook campaigns by over 250%! The difference between CPC, CPM, Optimized CPM, Optimized CPC and when you should use each one…as well as when you shouldn’t. My simplified method of researching and honing in on exactly the target audience you need for each ad. Why you are probably “targeting” the wrong people on Facebook and how ensure only the right people see your ad each time. When and where to use the Power Editor as well as step-by-step instructions on how to use it right. How to create “Dark Posts” on your fan page that allow you to run sponsored posts that never show up or “bother” your existing fans. How to run a “like” campaign correctly to grow your fan page for only a penny or two per click. One setting you MUST always “uncheck” when you run an ad or it will eat through your budget with nothing to show for it. My favorite type of Facebook “ad” to use when selling an item off of Facebook (perfect for Teespring, squeeze pages, or Info-products). A sneaky trick to use in your sales ads to prevent looky loos from clicking your ad and costing you money. What to do to prevent “banner blindness” and what to do when it starts affecting your ads. The 8 tactics I use when creating and selecting ad images to ensure they draw the eye and increase my click through rate. What all the fuss is about custom audiences AND how they can dramatically increase your profits when used correctly. How to craft high converting ad copy on the fly that will practically force people to click your ad. Exactly why most traditional list building methods are no longer worth following. 2 simple ways that absolutely anyone can set up an opt-in page even if they don’t have any skills or a website. My super effective “NO COPY” squeeze page that requires zero talent to create and converts at 74%. 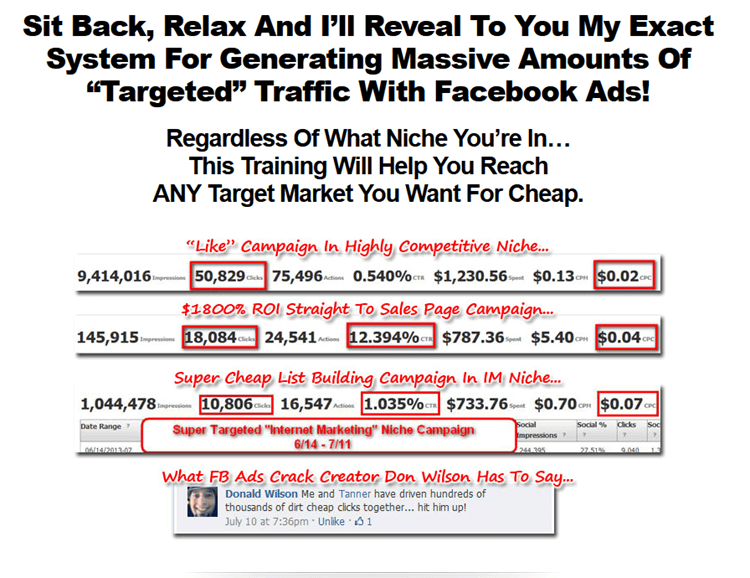 My easy Facebook posting formula that will have people joining your list by the dozens. How to ensure your squeeze pages never get “old” or people get tired of seeing them. A simple trick to keep your email complaint rate super low and your autoresponder provider happy. How to use Facebook PPC to increase your list building success by 400% and how to scale it to keep up with your profits. Exactly how I get tons free targeted traffic to my opt-in page every day with only a few minutes of daily work. The easy way to instantly build trust and credibility with your subscribers so they feel comfortable buying from you. My simple trick for leveraging 3 different list building methods at once to appeal to more of your target audience and get more subscribers. How “PA” can instantly boost your conversion rates by an additional 10% to 15% on autopilot. My exact follow up email sequence and how I $1k to $2k per email per month from each money email in the sequence. How to easily find the perfect “freebie/giveaway” that your market actually wants and will opt-in to get.